Rosemary DePauw-Brown, age 91, of Woodbury. Get on your walking shoes and follow in the footsteps of one of the strongest, most faith-filled women that we will ever know. 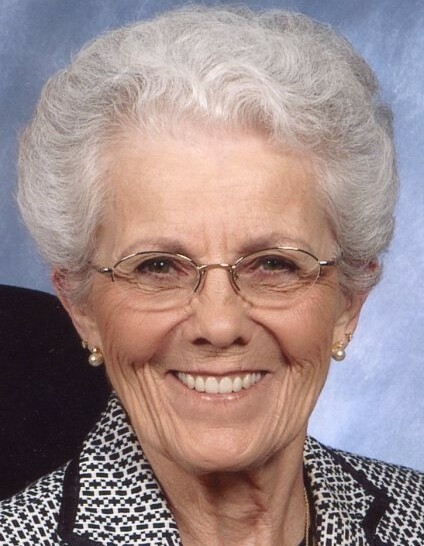 Rosemary DePauw-Brown passed away Saturday, February 9, 2019 surrounded by the family she loved so dearly. She was born Rosemary Augustine on May 10, 1927 in Geddes, South Dakota. Due to her mother’s hospitalization, she spent six years at Presentation Children’s Home in Sioux Falls, South Dakota. While always a devout Catholic, she grew in her faith and deeply loved the Presentation Sisters who cared for her. At age 14 she went home to Jasper, MN to care for her father and three brothers. In 1943 she moved to National City, California where her father worked in concrete shipyards. She graduated from San Diego Vo-Tech High School in 1950 and returned to Iowa. She married Norbert DePauw August 13, 1951 and resided in Worthington before moving to Slayton in 1956. They were blessed with eleven beautiful children. While four little babies passed away shortly after birth, she and Norbert raised seven strong, healthy kids, who grew up to have families of their own. After her youngest (Bruce) entered school, she worked at Murray County Memorial Hospital in Slayton, MN as a Ward Secretary. The family was involved with Star Tribune newspaper routes from 1964 to 1996. On July 8, 1982 she lost her oldest son James in a car accident, leaving behind his wife Margie and their 2-year-old daughter, Kristina. Norbert died November 11, 1987 after battling lung cancer. In 1996 she sold the family home of 40 years and moved to Cottage Grove, MN. Rosemary reconnected with Bill Brown, a former sweetheart from 51 years prior and on May 17, 1997 she became “his bride.” They had ten wonderful years together, sharing their time with both loving families and driving between Attleboro, Massachusetts and the Twin Cities several times a year. Preceded in death by: Husbands, Norbert DePauw and William Brown; son James; four infant children: (John Michael, Robert Joseph, Timothy John, and Lisa Marie); 10 brothers and one sister. Survived by: Jeanne Toews (Rick); Theresa Reeves (Mark); David (Deborah); Steven (Becky); Edward (Nancy); Bruce (Dawn); daughter-in-law Margie (Jim) Buckley; 16 grandchildren: David Toews (Sarah); Rebecca Toews (Shawn Rahaman); Sarah Quigley (Christopher); Naomi Reeves; Aaron Reeves (Sarah); Dan Reeves (Lauren Flach); Kristina Noble (Josh); Jeramy DePauw; Kelly Graham (Chad); Sarah Lindsay; Briana Gardner (Josh); Whitney Lunn (Jeremy Fischer); Katherine DePauw; Brian DePauw; Mikaela DePauw (Nick Borowske); Cassie DePauw. 19 great-grandchildren: Paige Haggerty; Alice and Peter “Gus” Toews; Ruby Luna Rahaman; Emily and Rosemary Quigley; Kaiden, Kyla and Brielle Reeves; Olivia, Colton, Ava and Lainey Grace Noble: Clayton, Caine, Kienan and Charlie Graham; Caleb Lindsay (Bree Sullivan); Jasmine Lindsay; (and #20 due in March! ); one great-great grandchild: Rowan; and stepdaughter, Patti (Jack) Dunbar. She walked faithfully in the footsteps of the Lord throughout her life, and now during our darkest times, she will carry us through our grief. Visitation 2-6 PM, Sunday, February 17 at Kok Funeral Home, 7676 80th St. S., Cottage Grove, MN, 55016. Mass of Christian Burial 10:30 AM with visitation beginning at 9:30 AM, Monday, February 18 at The Church of St. Rita, 8694 80th St. S., Cottage Grove, MN, 55016. Interment 10:35 AM, Tuesday, February 19 at Fort Snelling National Cemetery, AA#6. Memorials are preferred to the Cystic Fibrosis Foundation (cff.org) or Muscular Dystrophy Association (mda.org) or https://glioblastomafoundation.org or Fairview.org/giving with tribute gift to pediatric audiology.